Cloud computing promises to radically change the way computer applications and services are constructed, delivered, and managed. Although the term means different things to different people, and includes a bit of marketing hype and technical redefinition, the potential benefits are clear. Large datacenters permit resource sharing across hosted applications and lead to economies of scale at both the hardware and software level. Software services can obtain seemingly infinite scalability and incremental growth to meet customers' elastic demands. The pay-as-you-go model and rapid provisioning can result in more efficient resource utilization and reduced costs. Realizing these benefits requires new techniques for managing shared data in the cloud, fault-tolerant computation, service composition, scheduling, metering and billing, protecting privacy, communication, and, more generally, sharing resources among applications under the control of diverse organizations. The research community is stepping up to meet these challenges, as are a number of high-tech companies. This collection of papers highlights some early efforts in what is sure to be a productive area of innovation for years to come. 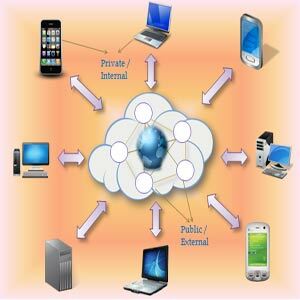 The following is a list of topics and associated published papers that focus on cloud computing. Each topic starts with a set of questions that may be of interest to both researchers and practitioners. The listed papers do not necessarily answer all of these questions, but were selected because they provide insights and introduce new relevant technologies.